So here you go, another Wedding Card request for a couple getting hitched next month. Again, memories of my crazy wedding day came flooding back. My dress was a beautiful, full-on meringue which needed a special hooped petticoat underneath to give me that ultimate puff-ball look. All day I floated about like a beautiful princess, wafting my big frock here n' there, knocking over small children & ornaments. My parents had kindly agreed that we could have our reception at their house with a small marquee in the garden. Because my dress was so 'meringuey' I couldn't fit into their downstairs 'cloakroom' to use the facilities when nature called, so I had to resort to 'hoicking' my frock up in a non-princessy manner to get up the stairs to the big bathroom. It would have been more graceful if I'd simply thrown myself out of a bedroom window afterwards using my dress as a parachute to rejoin our guests...but no...I gracefully walked back downstairs complete with the bathmat attached to the end of my dress that had managed to latch onto one of the wire hoops in my enormous petticoat that had worked its way loose! Honestly...I'm sure I was only put on this earth as the comedy act! There's more...(Yes More!) but you'll have to wait for the next wedding card. Oh Jane, this is too funny! I have a mental picture of you gliding down the stairs :) My dress had one of those hoop skirts too - layer upon layer of lace. I don't remember any mishaps though - almost 25 years ago so either dementia is setting in or I have chosen to forget :) Absolutely gorgeous card - one of my favorite LOTV images! 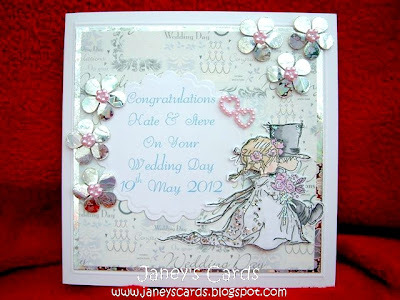 Wow gorgeous card Jane and fun story! I am so glad that you can laugh at yourself. Laughter always makes the heart lighter. This is a beautiful card. I really like that you personalized it.